Your studio sound is crucial. No matter if you're a performer, producer, and engineer, you rely on a studio monitoring system to ensure that all of your creative output sounds great throughout the entire process - from mixing and mastering to duplication and distribution for music lovers everywhere. 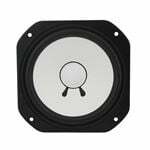 At American Musical Supply, you will find the latest in active (powered) and passive (unpowered) studio monitors, subwoofers, and desktop speakers to deliver superior sound in your studio - and beyond!